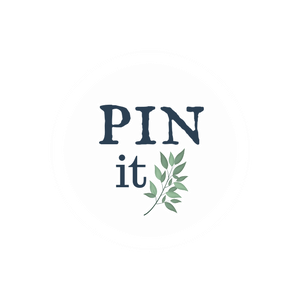 You are here: Home / Farmhouse / Want Open Shelves in the Kitchen? 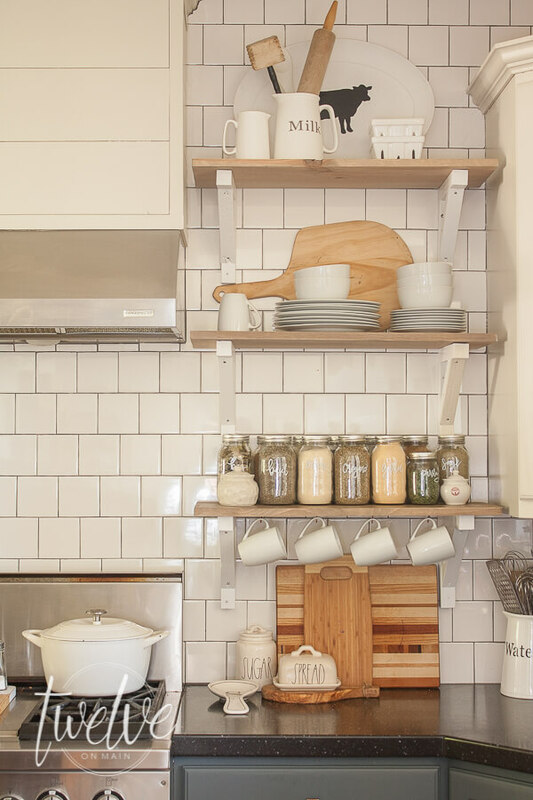 Want Open Shelves in the Kitchen? Hi friends! I am so glad you are here! 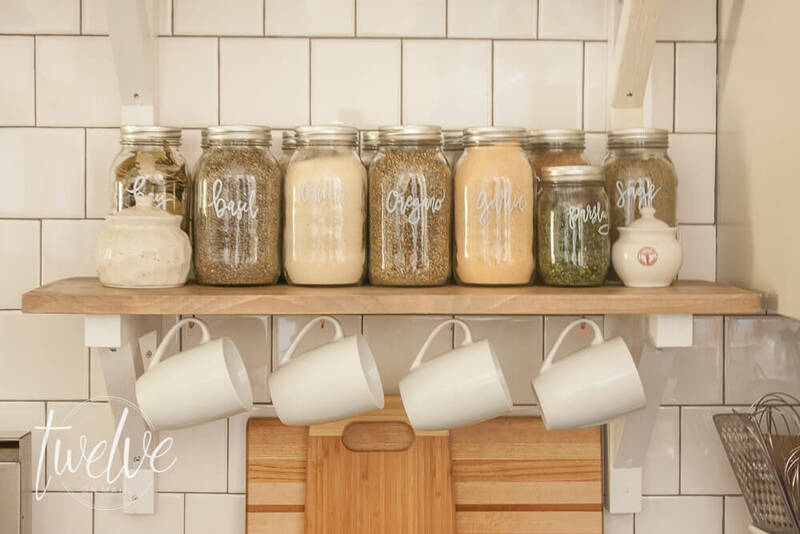 If you may have seen my post from yesterday, I talked all about a fun way to use mason jars to store your spices in your kitchen. If you haven’t seen it yet, click HERE to see how stylish mason jars can be. But, today, I am excited to talk all about my open shelves in the kitchen. Last fall I I made a bold decision. 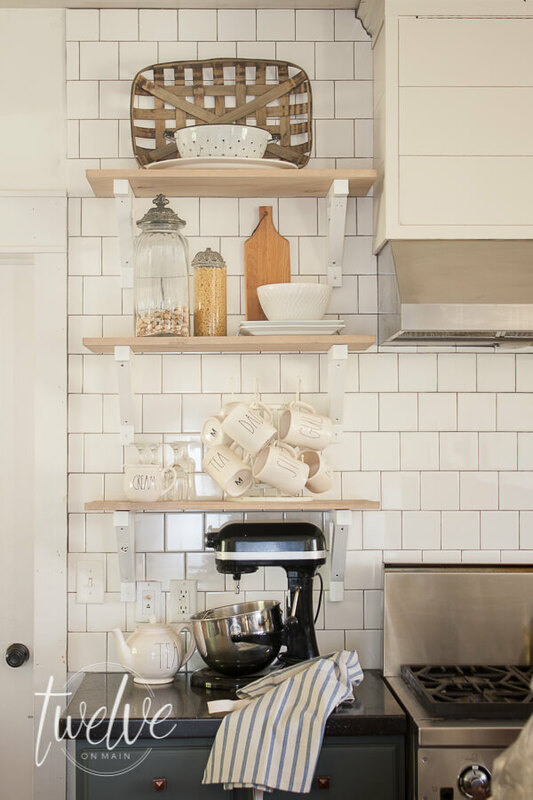 I consciously tore out 2 upper cabinets in my kitchen and installed some very pretty farmhouse shelves. I used the exact same method that I had used in my dining room when I used reclaimed wood to install open shelves there as well. This decision to install open shelves in the kitchen was one of the best ones I ever could have made. My husband was super concerned that I was taking away from our storage space. But, I had planned it out, and I knew that it could be even better with the right amount of planning and organization. Now, I am sure that my hubby thought I would set a few pretty decor pieces on them, and they would be completely useless. That is not how it works. 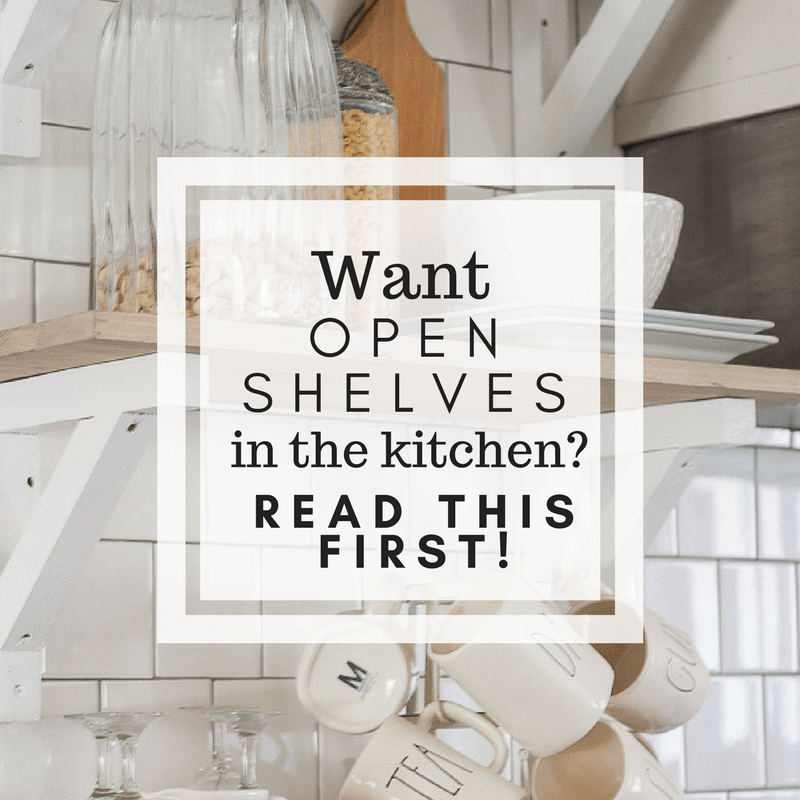 So, if you want to install open shelves in the kitchen but are concerned or unsure if they will work for you, keep reading! 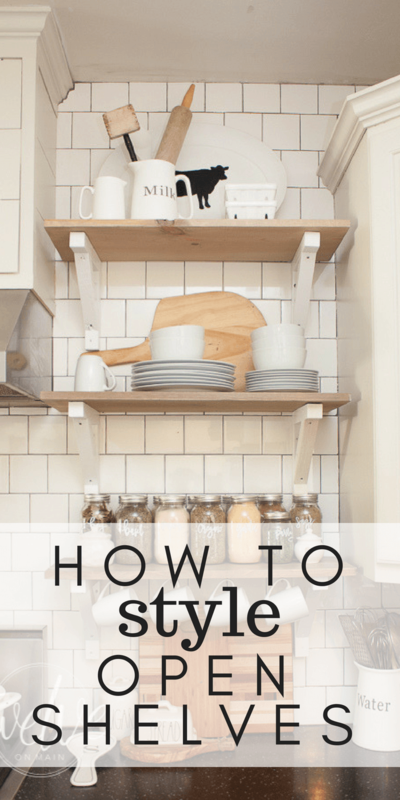 I am giving you my tips on how to style open shelves in the kitchen to be functional and stylish! Before considering open shelves in the kitchen, take inventory of what you have and what you need to keep tucked away. First decide what you use often. I have two different sets of dinnerware. I have our nice white set and a jumbled set of plastic plates and bowls that we use on on a more frequent occasion with the little kids. Before having my open shelves, I stored our white dinnerware in a dresser, so they weren’t ever getting used. I decided I would store these on the shelves. I chose to keep all out other plastic and mismatched dinnerware in another upper cabinet. So, essentially I split my kitchen wares into two different sets. Those items that were nice, and were used often I kept out and considered using them on my shelves. I then was able to hide my ugly, and not so pretty mismatched pieces in the cabinets. I also took into account our glasses, mugs, cassarole dishes, mixing bowls, pans, etc. The only thing I was concerned about was my spice cabinet, which was right next to the stove…exactly where my shelves were going to go. By simply rearranging some other cabinets, I was able to relocate my spices and making supplies into some bottom cabinets next to the stove. Eventually I decided I wanted to add my spices to the open shelves, hence the new mason jar spice storage. I love the way they look on my open shelves in the kitchen. Now, we have taken inventory and know that open shelves will work. 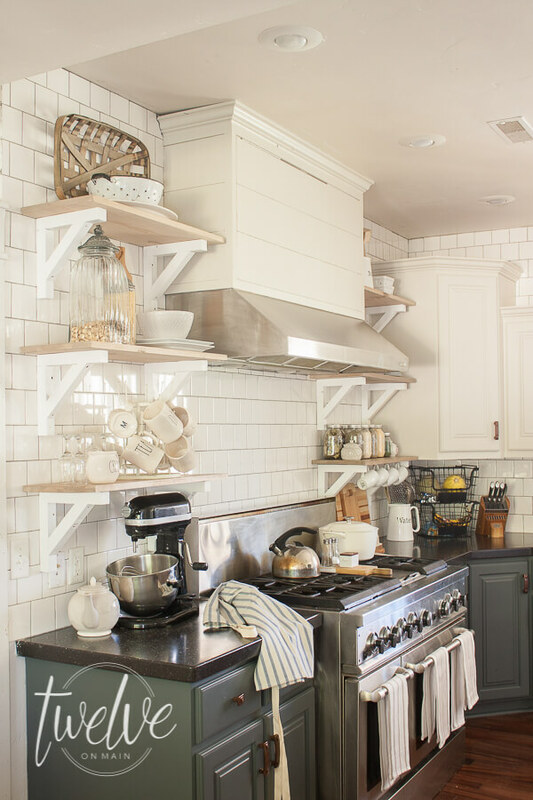 If you have decided you want to add some open shelving to your kitchen, start with just a few, unless you are going for a more minimal look to your kitchen, which is fabulous as well. But, adding one or two banks for shelves will make such a statement in your kitchen and it will break up the lines of cabinets. Make sure to install them where they make sense. I installed mine where I knew I would lose the least. I also wanted something that made a statement so I installed them one either side of my commercial range stove. The left side originally held my microwave which we easily relocated. The other side, like I said housed our spices. So not much was lost. 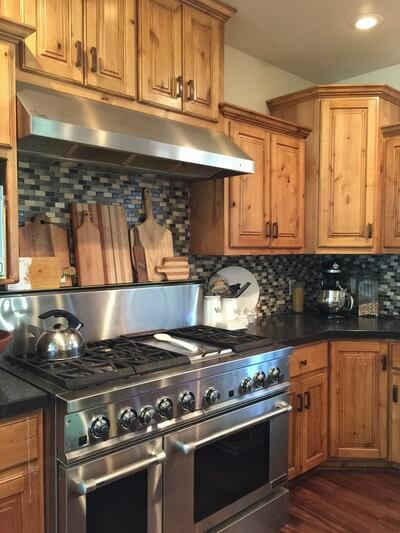 We chose to add three shelves on either side of the stove. I used the same method to build these as I had used in my dining room. You can see that tutorial HERE. 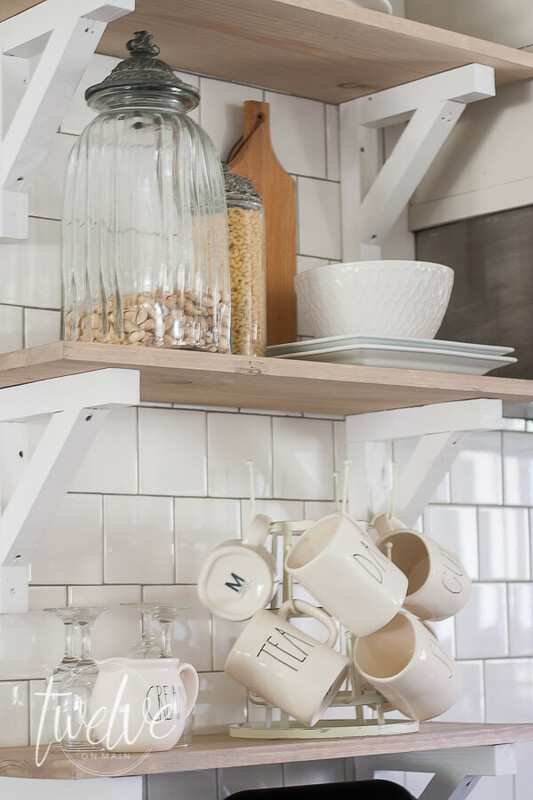 Now it is time to style those open shelves in the kitchen to be functional as well as stylish. I started by gathering up things that I thought might look good, and also collected items we used often. You will see the reason for this in a minute. This post contains affiliate links for your convenience…. Open shelves are a great place to display collections. I have a few different collections that I thought would work well. My Rae Dunn Clay mugs and wooden cutting boards. 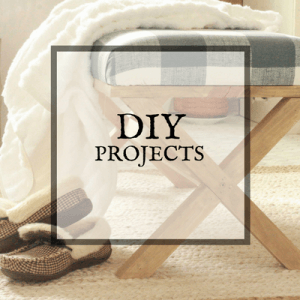 If you are looking for more of a farmhouse style look, these are definitely two great collections to have. Another great collection to acquire is white pitchers or other ceramic pieces. So I gathered my mugs, cutting boards, set of dishes, and them some other accessories including some other Rae Dunn pieces and containers. And of course….my mason jar spices. Now that I had gathered up pieces to use on my shelves, I started to set it up. I love styling shelves! I start by adding some of my main pieces and make sure they balance on each side. Make sure to consider function when doing this. I put all my spices on the first shelf on the right of my stove. This is where I do the majority of the cooking and having all these on hand is perfect. I then decided to add my collection of mugs to the first shelf on the left of my stove. This way they are easily accessible, yet not right in the busiest place in the kitchen. I also added small hooks to the shelf on the right and hung more mugs. This is a great way to use the selves in more the one way. Next, I wanted to put my white dishes near the dishwasher which is to the right of the stove, so I put them on the second shelf to the right, where they are still reachable, but not right in your face. Here is a secret. 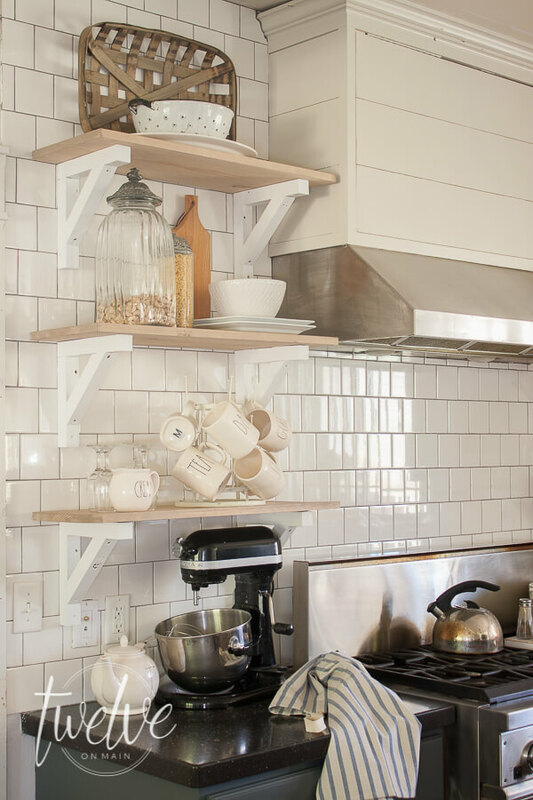 When styling open shelves in the kitchen, put the least used items on the top shelf, since they are harder to access. Now that I have the important items in place, I added some more decorative items to the upper shelves. I then took a step back to assess what needed more. I was able to balance out the shelves by adding some of my cutting boards to the shelves. The reason you want to keep those items you use often near the bottom is because one of the plagues of having open shelves in the kitchen is dust and grease. Many people have asked my if this has been a problem, and for the most part….NO. But that is because the things that would get the most grease, dust, etc are used almost everyday and are washed and put away. They don’t have a chance to collect dust. The items on the upper shelves may gather more dust, and that is why I recommend cleaning those shelves at least every 3 months if not sooner. But that is totally up to you. Tips on how to keep your styled open shelves balanced…. Make sure to consider height and size of items. If you have a large piece like a bowl, it may not need much else to blance that shelf but the shelf opposite will need an equal amount of space to be taken up. See on my tallest shelves, I balanced the bowl, platter, and tobacco basket with a pitcher, cow tray and other small white pieces. If you have something tall, like a large jar, balance it with 2 or more other pieces next to it with differing heights. This is a huge rule in interior design. The rule of three…. Three items tend to balance and make more sense to our eyes and senses. If you notice, most of my shelves consist of three different “piles”. Take the shelf with my dishes. I broke them up into 3 different piles instead of stacking them up all together or in two piles, which just isn’t as pleasing. Break up those collections. Don’t stuff all those pretty pieces on one shelf! Or do, if you have just that many! Or send some to me, since I am a huge fan of collecting beautiful things. I have considered displaying all my cutting boards together, and I have done it in the past, but I like breaking them up as well. It balances out the warmth and texture. 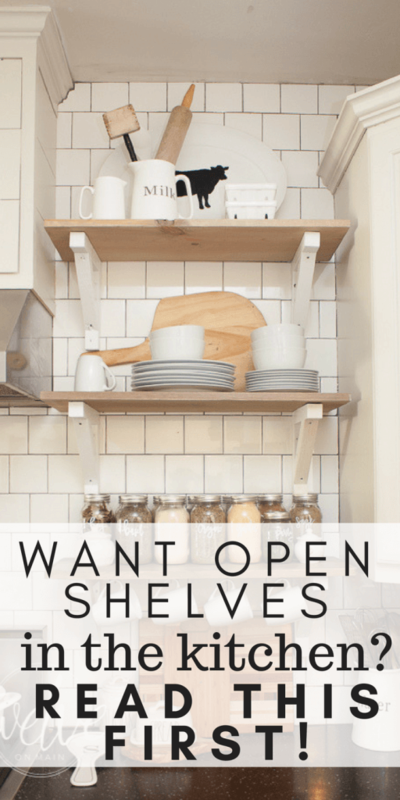 There are so many things you can do with open shelves, and especially with open shelves in the kitchen. Not only does it add style to your space, it opens up the space and makes it look larger! I LOVE my open shelves. 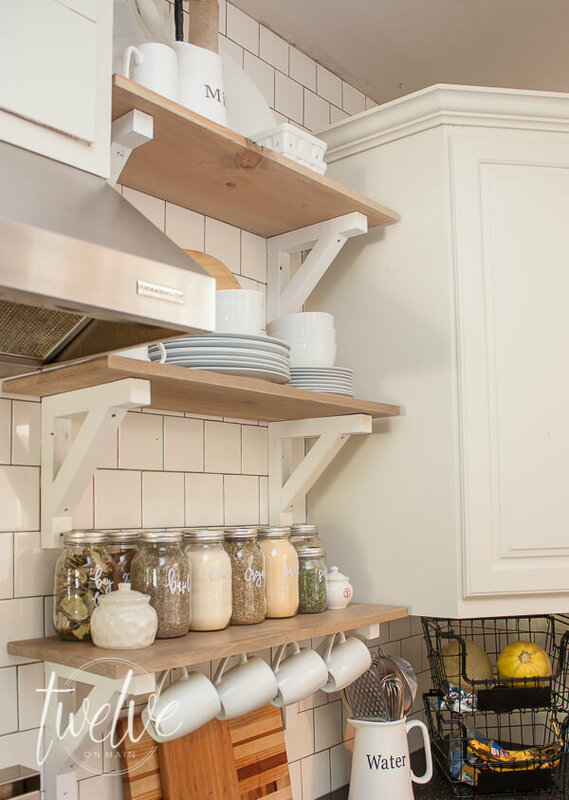 Now that you have read my tips on open shelves in the kitchen, are you ready to install some in yours? I absolutely love mine and I wish I would have put them in sooner! They are a great way to combine beauty and function in one place, which is always a wonderful perk when decorating your house. So, I think it would be good to save this for later! I hope you enjoyed this post. I really love putting my heart and soul into my website and I truly hope that you find something that inspires you! 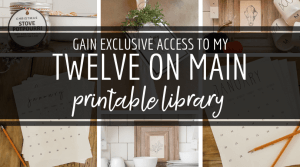 As a thank you, I am offering free access to my printables library! Click below to get access! And make sure to check out these posts as well! Love it ! Laughed out loud when you said your husband freaked,out !!Ha! Thanks this will be very useful when i add mine. My husband isn’t a fan, either, but maybe I could talk him into one or two small shelves. I think your kitchen is delightful! I love your new kitchen! The new tile and open shelves are stunning! 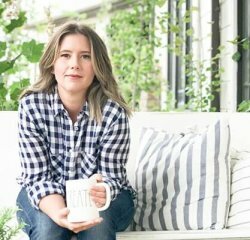 This is a great breakdown on open shelving. I took the doors off two of my cabinets and backed them with mirror and loved it. Now I am seriously contemplating open shelving on the other side. Thanks so much for sharing tips! I love open shelving in the kitchen. Yours look wonderful. Thanks for the tips. I love what you did! It looks so much more homey and not so boxy. I did a similar thing in that I removed a large built in pantry cabinet and added a large open bookshelf and a butcher block table. I love the change and we use it for our dishes and glasses that we use every day! How did you decorate the jars? Did you use stickers? Thank you. I used a white sharpie marker and write on the jars. What color did you use on your cabinets? 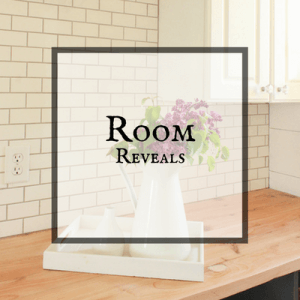 Also, what flooring did you use for your kitchen? Your shelves are lovely. I like how you have them styled. And they are perfect for that farmhouse look and feel. I have a tiny 570′ vintage farmhouse. When i moved in I removed the big box store cabinets and installed all open shelving above the counters. While I like being able to reach and grab items easily, they do get dusty. I live in NC and with the combination of big dogs and red clay, well it keeps dust flying. I take all my dishes off my shelves and wash them once a month. Extra work,, but in my world cute over rules practical. I suspect you don’t have that red clay dusty issue? Lucky you. This is a very helpful tip. I like your information. Your information is very helpful for the people. Thank you for share such post. Sara, how long have you had the open shelves, and what I always wanted to ask; Don’t they get messy from steam, grease etc? Ive had them over 2 years. They have held up wonderfully and the only items that tend to get greasy are the spice jars to the right of the stove. Everything else gets used often enough it doesnt have a chance.